I am a total nerd and I am not ashamed of it. As a card carrying nerd (that grew into a soil scientist), I have always wanted to be the expert on a space mission that will colonize another planet, and terraform it (make it suitable to plant growth and human habitation. Of course, Mars is one of the most common of these speculations. Lucky for those of us that live in the southeast, Mars has very similar soils. There is a lot of sticky, oxidized red clay. These clays are not very productive, which, historically, is one of the reasons that tobacco was chosen as a crop. Now, tobacco is a very labor intensive crop (hence the unfortunate use of human labor before 1865). It demands a LOT of pesticides as well. Therefore, why pollute our environment, when we could outsource it?!?! (This blogger does not advocate the use of outsourcing, nor tobacco). Tobacco is planted in a greenhouse or coldframe, then transplanted to the fields. After it is harvested, it is stacked in the field to dry down (which is why there are several different colors in the field). One of my friends challenged me about a month ago to create a surreal landscape of Tobacco on Mars. This is the final pastel renditions of these fields. 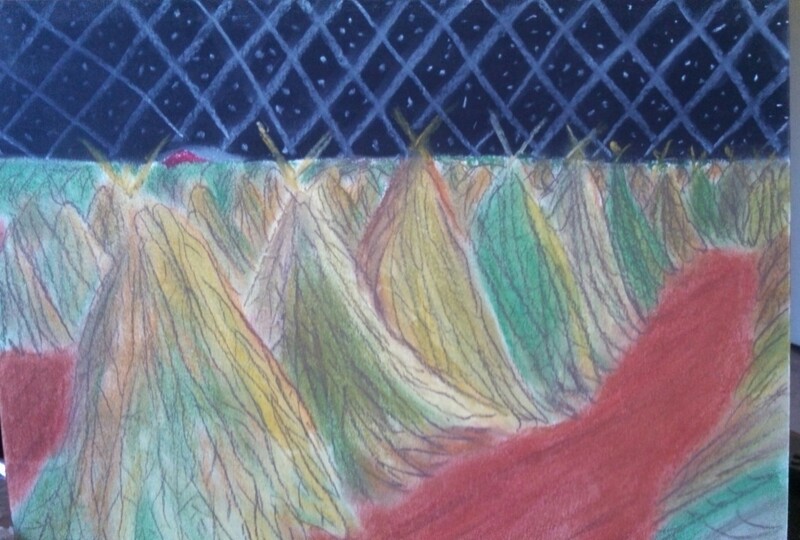 The barn in the background, below a dome of stars (with supports), with tobacco in various stages of drying (created with pastels, gone over in hard pastels), with the bright red earth peeking through. So, even though this piece is a little more Sci-Fi than others, I sorta like how it turned out. Mars has a ton of red clays, just like the southeast. Therefore, once the new domes are created in our colony, we can be the hub of interstellar tobacco trade!